Pyrroloquinoline quinone (PQQ) is regarded as one of the most powerful anti-ageing and cognitive health supplements available. Discovered in the late 1970’s in Japan, PQQ is a small quinone molecule. Mitochondrial Biogenesis - The creation of new mitochondria. Mitochondria are known as the powerhouses of human cells as they create adenosine triphosphate (ATP) which is the main source of energy in humans. As we age we have less and fewer mitochondria. PQQ may be helpful within this process. Nerve Growth Factor (NGF) - As its name suggests, NGF is involved primarily in the growth, maintenance and survival of nerve cells and also in stimulating neurogenesis - the creation of new neurons in the brain. Reduce Inflammation - PQQ may also also help to support overall wellbeing and sleep cycles, as well as cognition and memory recall. Coyne Healthcare was founded in 2013 in Cape Town, South Africa. Through collaborations with world-leading experts, we are able to deliver and make accessible the very best the world has to offer in nutraceuticals and supplementation. Our products are trusted by medical professionals looking to improve the lives of their patients. Microactive™ ß-cyclodextrin and ubiquinone with BioPQQ®, vegetable cellulose (capsule), vegetable stearate, silica. Take 1 vegicap daily in the morning with or after food or as recommended by a healthcare practitioner. Should not substitute a varied diet. If you are taking antihypertensive medication or have any bleeding disorder, consult your healthcare professional before using Liposomal Vitamin C.
This product is a food supplement and not a medicine. It is not intended to treat or cure any illness. 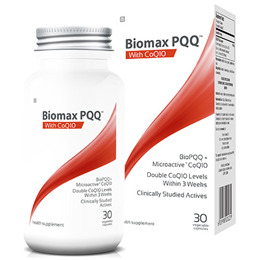 Should you have a medical condition please consult with a healthcare professional before using Biomax PQQ™ supplementation. Below are reviews of Coyne Healthcare Biomax PQQ with CoQ10 - 30 Vegicaps by bodykind customers. If you have tried this product we'd love to hear what you think so please leave a review.